In his preface to The Symbolism of the Stupa Prof. Craig Reynolds writes "The stupa is a symbolic form that pullulates throghout South Southeast and East Asia. In its Indian manifestations it is an extreme case in terms of architectural function: it has no usablehas a basic simplicity. 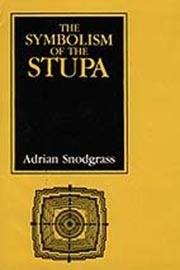 In this state of the art` studt Adrian Snodrass reads the stupa as a cultural artifact. The mounment concretizes metaphyswical principles and generates multivalent meanings in ways that can be articulated with literary texts and other architectural forms." Professor Adrian Snodgrass is Adjunct Professor with the Centre for Cultural Research. He is an internationally renowned authority in Buddhist studies and Buddhist art. He also researches in the area of hermeneutical philosophy and its application to knowledge production and cross-cultural understanding. He is editor of The Architectural Theory Review and Architectural Theory, and his books on Buddhism have become classics in the field. Adrian Snodgrass is a founding member and honorary life member of the Asian Arts Society of Australia.